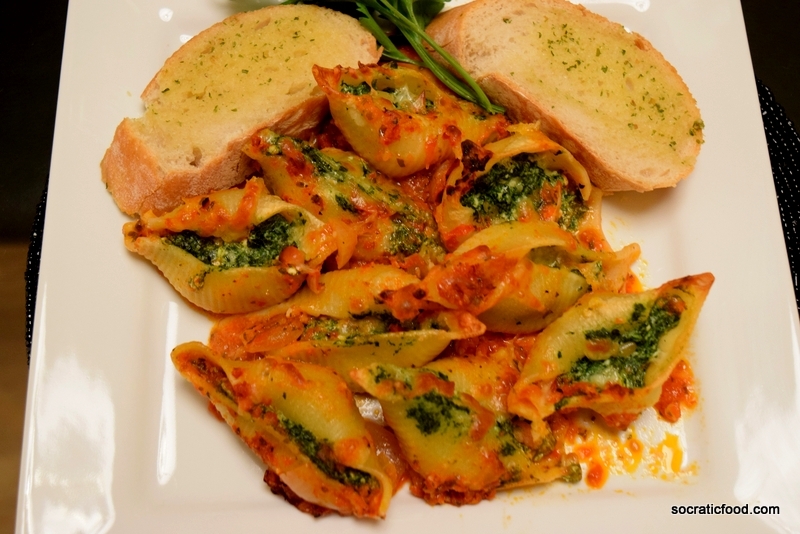 There is a vast variety of pasta shapes in Italian cuisine, which can be quite overwhelming. While the most popular versions in the rest of the world are spaghetti, penne and lasagne, different shapes have their particular use for creative meals. 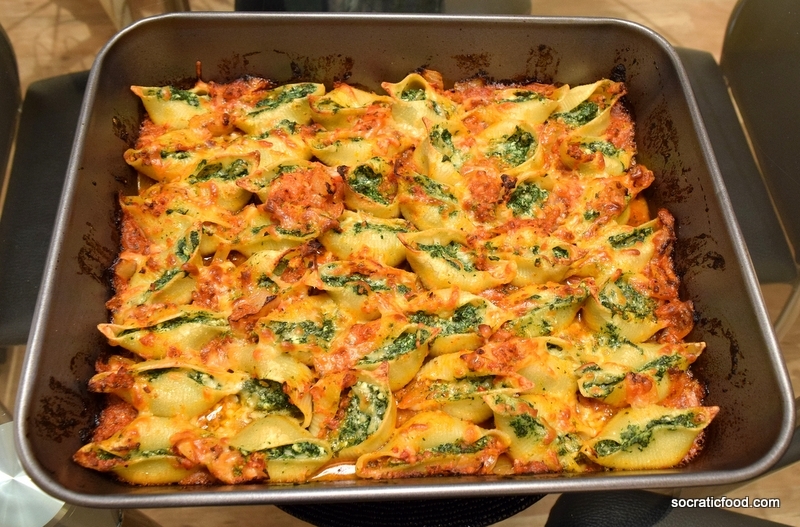 Stuffing pasta shells (“Conchiglie”) with spinach and ricotta is one of my favourite recipes. It requires some time and patience but the result is very rewarding. The key is to boil the shells for 2-3 minutes less than the recommended time so they are still hard and can stand in the tray. I like to use fresh tomato sauce since Passata or ready-made Marinara sauce have this strong “concentrated” and artificial taste. However, since the tomatoes where I live are not that great, I also introduce a couple of teaspoons of tomato paste. Just for the kick! 400 gr (14 oz) pasta shells. 400 gr (14 oz) fresh spinach. Small bunch of flat-leaf parsley. 1/2 cup of extra-virgin olive oil. Grated parmesan for topping and serving. Boil the pasta shells 1-2 minutes less than the recommended cooking time on the box. Drain and let them cool down. Wash the spinach and drain well. 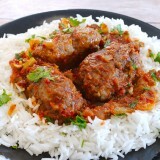 In a large frying pan or pot add 2-3 tablespoons of olive oil and heat on a medium heat. Add the spinach and toss well. It should start reducing in size. Cook for ~ 10 minutes until juices have reduced. 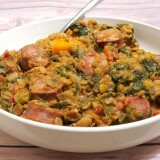 Drain the excess juices and pass the spinach through a blender for a few seconds to make a coarse paste. Heat up 1 tablespoon of olive oil in a pan on a medium heat and brown the pine nuts for ~ 1 minute. Set aside. Add the tomatoes, garlic and parsley in the blender and make a smooth paste. Add 3-4 tablespoons of olive oil in a pan on a medium heat. Fry the onions until softened. Add the the tomatoes from the blender, the concentrated tomato paste and ½ a cup of warm water. Season with salt and pepper, add the paprika and 1 tablespoon of oregano. Lower the heat, give it a stir and let it cook for ~ 15 minutes until the sauce thickens. 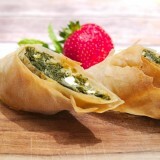 In a large bowl add the spinach, ricotta, pine nuts and half the grated mozzarella. Season with salt and pepper and mix well. Heat the oven at 180 degrees Celsius (360 F). 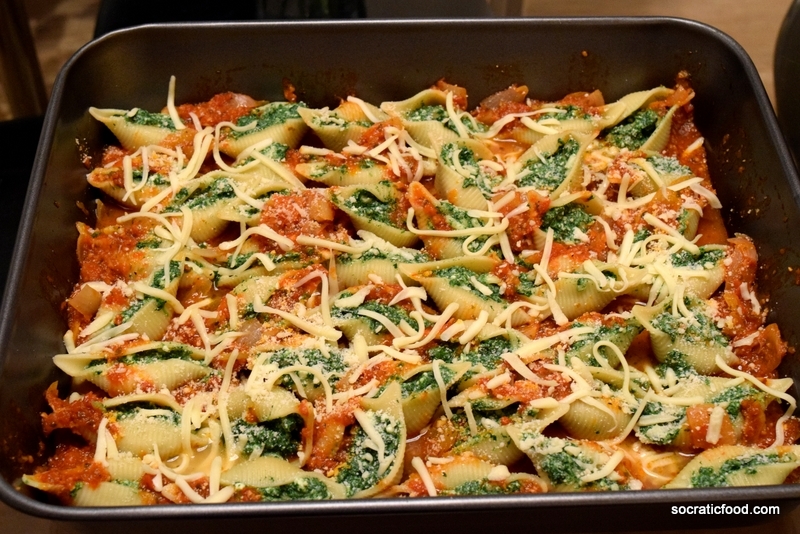 Use a teaspoon and fill the pasta shells with the spinach mixture. Place them on a tray, add the tomato sauce, the rest of the grated mozzarella and sprinkle some parmesan on top. Cook for ~ 20 minutes until the cheeses have melted.